I completed round two on the pattern for the baby bootie. It wasn't as difficult as I first expected last night when I was reading the pattern. I just had to remember to take it one step at a time and it worked out just fine. I remembered what my mother taught be about reading crocheting or knitting patterns. Don't read so far ahead and to do the work from one comma to the next one. That works the best. I also copy the patterns and cross off each section as I complete it so that I don't get lost. Now it is on to the sole of the bootie. I also started an edging for a hankie for my Aunt. She is 81 years old and game me a tube to store my tatting in for Christmas. I am sure she will be happy to get some tatting and a hankie is best for her. It is the hen and chicks pattern so that I don't have to study a pattern and I can take it anywhere to work on. I hate to sit waiting for an appointment with nothing to do. 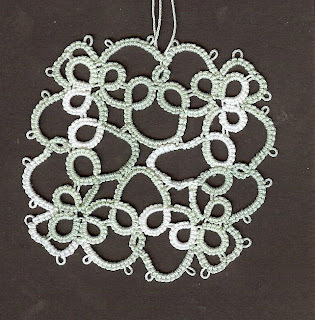 I usually take a book to read but the tatting will work just fine. Plus I can show it off. Your baby bootie looks great so far! I'm liking that pattern and the color. What book is that from? Just take your time and you'll have a pretty pair of booties in no time. The 'one comma at a time' process is how I learned, too! You're right, it does work the best.